The Information Technology department strives to offer an empowering, technology rich environment and to lead technology initiatives with innovative strategic vision, while delivering exceptional customer service, support, and security to the College user community. When you submit a ticket here, FAQs are available to help you work through common issues related to the topic you select. What do I do when I cannot login to my account? You can reset your password from the Student or Faculty portal, if you have signed into the Portal before. I just reset my password and not it’s not working. What do I do? If it is still not working (or you don’t have an hour to wait), you can call the Helpdesk. 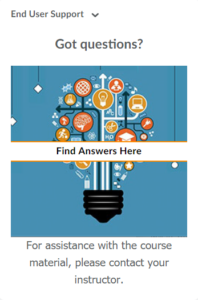 I am having trouble with my Brightspace courses. What do I do? If you cannot login, call the Helpdesk. Once you are able to login, look for the End User Support section on your homepage (the first page you reach when you login). You must launch your request from help from this link in order to get assistance. You can request a phone call if you are more comfortable talking with someone for help. I do not have Microsoft Office on my computer. How do I get it? I need software other than Office for my coursework. Where do I go? Visit http://smwc.onthehub.com and browse the software offered at an educational discount. Create an account using your SMWC email address and you can purchase the package you need.